Sometimes inspiration comes from an unexpected source. Making dinner one evening, while I had my reading glasses on to look at a recipe, I took a closer look at the garlic I was holding in my hand. I had just broken some cloves off and what was left was some thin transparent flakes of skin, the root and the rest of the cloves. The garlic wasn't just white but many different colours ranging from yellow ochre, pale purple, blue and brown. I've never been much good at cooking so the dinner was no success, my mind was elsewhere as it usually is. I couldn't wait to start painting the garlic. 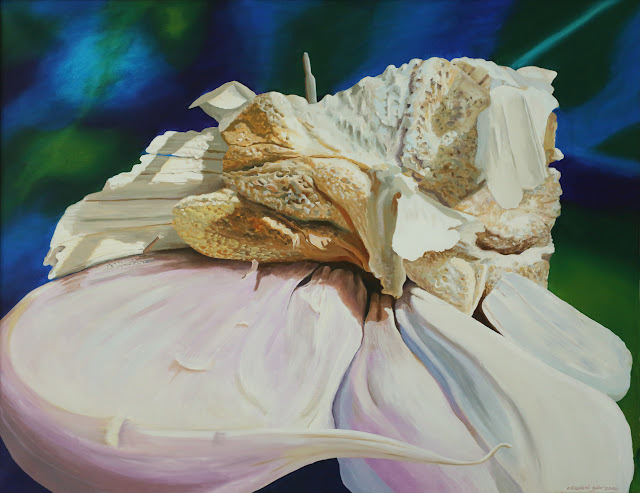 The painting was much larger than life so I could render the garlic in every detail. I chose complimentary colours for the background in order to bring out the pale shades of the subject itself. The painting was sold a few years ago but the other day I was glad to have the opportunity of seeing it again in its present surroundings, a beautiful private home in Helsingborg, Sweden. The garlic is so very beautiful, Elizabeth! I cherish those moments of such depth of "seeing".